This is a copy of a publication in Political Sociology: States, Power, and Societies, ASA Political Sociology section newsletter, 12(1):6-8, 2005. The complete symposium is available in pdf format. Please cite as: Deflem, Mathieu. 2005. “Tribal Modernity? 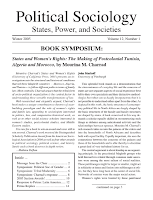 Reflections on Mounira Charrad’s States and Women’s Rights.” Political Sociology: States, Power, and Societies, ASA Political Sociology section newsletter, 12(1):6-8. Alfred Hitchcock’s film of the modern American family, “The Man Who Knew Too Much” (1956), tells the story of a happily married couple and their young son on holiday in French Morocco. In the opening scene of the movie, we find the family aboard a bus en route to Marrakech. Mayhem ensues when the couple’s son accidentally removes the veil from a local Muslim woman. The accident turns out to be a hoax meant to lure the family into an assassination plot. When the son is kidnapped, the parents set out to rescue their child. In Casablanca (1942), a movie that in terms of its exotic foreign locale was modeled after the 1938 Warner Brothers hit Algiers, several couples are entangled in mystery and love at the dawn of World War II. A police captain enjoys a string of romantic escapades with women eager to obtain an exit visa, a young wife convinces a bar owner to let her husband win at roulette, and an attractive European woman is torn between the love she feels for one man and the admiration for another. Judging from Mounira Charrad’s (2001) book, States and Women’s Rights, it is perhaps not altogether accidental that these Hollywood ventures into the perils of family life and romantic relationships are set in the locale of the maghrib of northern Africa. States and Women’s Rights offers a comparative-historical sociology of the relation between state and civil society by means of an investigation of the structural conditions of family law in three north-African countries. Focusing on three countries in the maghrib, Charrad finds that family law in Tunisia expanded women’s rights after the country’s independence. Morocco adopted an Islamic conservative policy, as did Algeria after a long struggle between competing political fractions. Tunisia outlawed the practice of repudiation and the husband’s right to end a marriage at will, while instituting legal divorce proceedings that are equal for husband and wife. Morocco, on the other hand, enacted strict Islamic family laws, including such provisions as polygamy, repudiation, and patrilineal inheritance. Algeria experienced a struggle between conservative and reformist trends for more than twenty years until strict Islamic family law was finally instituted. Charrad argues that the interlinking of the (central) state and the (local) tribal society is critical in understanding the differences in family law in these three countries which, otherwise, have much in common. Perceived at the intersection of kinship and state, family law is interpreted by Charrad from the viewpoint of women’s rights. “As interpreted here,” she writes, “Islamic family law legitimizes the extended male-centered patrilineage... It supports the patriarchal power...” (p. 5). Conversely, reforms of Islamic law, such as those that took place in Tunisia, center on the rights and duties of individuals, male as well as female. Mounira asked me to contribute to this book symposium from the viewpoint of my expertise in the sociology of law. I suspect it was unbeknownst to her that I also have a background in anthropology and the sociology of developing societies from when I was a student in Belgium and England in the mid to late 1980s. In fact, had it not been for the last-minute offer of a sociology assistantship in 1989, I would have gone to Tanzania for two years and thereupon pursue a Ph.D. in anthropology. My excursions into the discipline of anthropology since then have been cursory, but I am pleased to see a fellow disciplinarian rely on anthropological insights to substantiate her sociology of non-western societies. Of course, the sociology of the non-west is not altogether new (e.g., Donald Levine, Immanuel Wallerstein, Erving Goffman), but it remains true that the case has to be actively made to develop and defend a sociology of tribal societies. I am generally sympathetic to Charrad’s effort to bring the tribe back in and her argument that tribal societies are different from class societies. In States and Women’s Rights, Charrad makes a strong case for the study of state law as a result of the interplay between the state and civil society in the variable circumstances of particular socio-historical contexts. The tribe is a localized mode of social organization that not only pertains to a different jurisdictional sphere than the central state, but that is also of a qualitatively different order because tribes are primarily based on kinship (broadly understood). However, Charrad also conceptualizes the tribe “as primarily a political entity” (p. 9). Her interpretation of the tribe, in other words, re-articulates tribal society in terms that are conceptually accommodating to the needs of modern state systems. Instead of a perspective of a tribe as a comprehensive social order (which Durkheim called organic), Charrad views of the tribe in functional terms, functional for the development of the state and her perspective thereof. I wonder to what extent this approach to tribal society corresponds to developments in the maghrib, or, conversely, to what extent it is actually a modernist reading of an essentially premodern phenomenon. Is it useful to speak of tribes as political units rather than as social units which comprise a multitude of functions, only some of which are political? Critically, I suspect that Charrad has introduced tribal society as an alternative to class-based society, only to reaffirm the latter’s conceptual primacy and the former’s formal similarity: class as a formative principle of modern state power becomes tribe as a formative principle of state power. But perhaps it is perhaps not altogether wise to think of tribes exclusively in the terms of the modern states that developed only after the forces of colonization. In relation to Charrad’s tribe conception, also, her perspective of law is an instrumentalist one. Much like orthodox Marxism conceives of law as a tool to generalize and thereby further the particularistic goals of the powerful class, in Charrad’s maghrib world Islamic law appears as a tool to enforce the will of the tribal bourgeoisies of old. From Charrad’s viewpoint, family law then becomes an “inherent part of the larger struggles to build a modern state” (p. 239). Yet, sociologists (and anthropologists) of law have long since Marx’s death abandoned an instrumental perspective of law in favor of a multi-dimensional and dynamic approach. Most famous in this respect is the notion of law as a social field that is semi-autonomous relative to the state. Charrad’s perspective is perhaps the result of the fact that in her work family law appears only as state legislation. Even then, the development of family legislation might have been more appropriately interpreted in terms of a process of juridification. Changes in family law may have originated from the interplay of the more or less conservative demands of a tribal lifeworld and a central state, but once they are phrased in the terms of formal legislation, they will also be accommodating to the needs of the state. And this formalization of family law applies to the states who adopted changes a much as to those that did not. Any legislation concerning family and kinship involves the formal regulation of a social sphere that was hitherto regulated outside the context of the state, for the social structure of the family (much like kinship-based society as such) is not dependent on the legislation of states. Therefore, juridification in the case of family law not only means an establishment of basic legal principles for all family members (dismantlement of the ‘pater familias’), but also involves a reconfiguration of the family and its members as legal actors. Wife, husband, and child now appear to one another also as the carriers of legal entitlements and as the potential claimants in a legal dispute over contractual obligations under circumstances that are specified and enforceable by the state. Family law is not constitutive of the family. Family law instead reconstitutes the family as a legal unit with all due consequences. Also, Charrad focuses on family law in terms of rights, further specified in terms of women’s rights. The dyad of state and law now becomes a quartet with rights and gender, raising several pressing conceptual and empirical questions. What is the relationship between law and right(s)? The traditional view of law and morality (legality and legitimacy) would maintain that one is maintained by the other in some specific fashion: that law is an indicator of morality (Durkheim), that legitimacy in modern states is secured through legality (Weber), or that law furthers injustice (Marx). In any case, Charrad’s concepts of law and rights are so intrinsically linked that they can barely be differentiated. Laws further or hinder the development of rights. Rights are expressed in and guaranteed by law. In Charrad’s maghrib world, Islamic tribal law is equated with a curtailment of women’s rights. Charrad mentions a number of dimensions of the “legal subordination of women” (p. 33) in Islamic law, such as the possibility of child marriages, the rights of the woman’s father to marry his daughter, and various differential rights of husband and wife. Unless Islamic laws are changed radically, Charrad suggests, such laws cannot but deny women’s rights. The reform of family law becomes an indicator of the modernization of the state. Laws that accord relative equality to men and women are not interpreted as developments of Islamic law, but as an expansion of women’s rights against Islamic law. Thus, in Charrad’s work, rights do not exist outside the context of law. Yet, rights might be better understood to exist before and outside the law, although not outside of the context of society. Additional questions concern the relation of gender with law and state. Charrad interprets family law at once in terms of gender as well as power and solidarity. This conceptualization is an articulation, I believe, not of law but of gender relations. Only by infusing the concept of gender in the relations between state and tribal society, family law receives the centrality it enjoys as a women’s rights issue in Charrad’s study. That is odd move on conceptual grounds alone as families contain more than only women. It is further not evident to think of the relations among family members in terms of power and stratification nor to conceive of rights as gendered rights, especially not when they are inclusive rights for men and women. In Charrad’s world, power and gender are ubiquitous. Unwittingly, I fear, Charrad’s book reconstructs a modernization discourse. At times, Charrad is even fairly explicit about the modernizing qualities she attributes to the changes in family law that can or cannot take place. Charrad speaks of ‘reforms’ of law, not mere changes, and her terminology may have motives beyond its strategic implications. Islamic law can be subject to a “conservative interpretation” (p. 232) or can be changed by “modernizing reforms” (p. 112). By whose standard are these terms appropriate? Introducing rights so intimately in a debate over changes in maghrib family law will have far-reaching implications for a sociological perspective. Can we choose against rights? Do we need to choose? Or, could I —having grown up in a small village in a bilingual and predominantly Catholic country in western Europe— analyze said developments of family law in terms of men’s rights? Or as children’s rights perhaps? The colonial sociological gaze and its obsession with rights, of course, is very different from formally similar developments within the societies at hand. It is one thing for a western sociologist to question women’s position in Morocco, but an all-together different matter if such critiques erupt in the arena of the Moroccan public sphere. Late 2003, for instance, Morocco’s King Mohammed defended the right to legal equality between men and women. “How can society achieve progress,” the King queried, “while women, who represent half the nation, see their rights violated and suffer as a result of injustice, violence and marginalization?” (cited in The Washington Times, November 26, 2003). And such internal developments may also carry over from one maghrib society to another. But infusing a rights discourse from the western world into northern Africa may appeal to American social scientists more than to women of the maghrib.